Masato Nakamura, left, and Miwa Yoshida of DREAMS COME TRUE. Dreams Come True (ドリームズ・カム・トゥルー) is an influential music duo from Japan, formed in 1988. They are renowned for their melodies and poetic songwriting, and have sold more than 50 million records worldwide. Dreams Come True was started by Masato Nakamura, and is fronted by Miwa Yoshida, who is the band's main songwriter. They were originally a three-piece band with Takahiro Nishikawa on keyboards, until he departed in 2002. The band is commonly known as DCT (Dreams Come True) and sometimes referred to as "Dorikamu" (ドリカム) by their fans. Dreams Come True released their self-titled debut album in 1989, which sold more than one million copies. In 1993 they recorded "Winter Song" for the opening theme of Tristar Pictures' romantic movie "Sleepless in Seattle" and the following year recorded the song "Eternity" for the animated film "The Swan Princess" by New Line Cinema. In Japan, they recorded many theme songs for Tokyo Broadcasting System television shows, and it wasn't long before they caught the attention of the Walt Disney Company, and were hired to create various musical-tunes for their television shows, and attractions at the Tokyo Disney Resort. In 2001, they composed the theme song for the Disney film "Atlantis", and Miwa was hired to be the voice actor for the character Audrey Rocio Ramirez in the Japanese version. Masato Nakamura was hired to compose the music for a few television commercials, and around the same time compiled various "Dreams Come True" songs for the Konami corporation to be used in their game series Dance Dance Revolution. He has previously composed the music for the Sonic the Hedgehog video games on the Sega Mega Drive. They have also been involved in various charity events. Included among these are a collaboration with Ryuichi Sakamoto in 2001 to help raise funds for land mine removal agencies, and taking part in the Live 8 benefit concert in 2005. Dreams Come True's 1990 tour poster. The text on the flyer reads: ”かわいいヤツには、トゲがある。” which is a bit of a pun. The literal translation is: "for a cute guy, he has spines," but the Japanese word for spine, トゲ, can also mean "biting words." 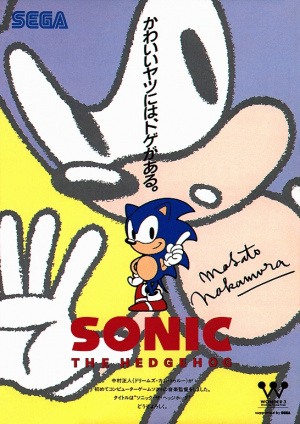 Nakamura was picked by SEGA to compose the music for the original Sonic the Hedgehog early in Dreams Come True's career, in 1990. Later that year, on November 7, Sonic was revealed for the first time by being painted on the side of the band's tour bus. Sega.com interviewed Masato Nakamura about the process of writing music for the game. “ Sega.com: Were you a bit lost, seeing as this was your first time handling video game music? Nakamura: The first thing to come to mind when I thought about game music was the blips and bleeps from games like 'Space Invaders,' actually (laughs). But no, I think I knew where I wanted to go with things. Also, that time was sort of the turning point for music-making, in that we really put our hearts into the idea of using computers to make music, and that's when all this started. So, it was really perfect timing to be given the chance to do the music for 'Sonic' when I did. Art, entertainment, and computers all just came together and sprung to life, and that's where 'Sonic' was born. Sega.com: And so you really put your heart into making the music for 'Sonic,' then? Nakamura:The actual music was done on an Atari computer. The really hard part was the limit on the number of sounds available. At the time, the key point was the number of sounds that could play simultaneously, and so it was really hard, deciding what sounds you could get out of it at once since that number was so limited. And unfortunately, with what I had to work with, I had a limit of only four sounds that could play at the same time. And so you couldn't create CD-quality sound like modern games have. For instance, since I only had four sounds to work with at once, I could have a bass drum line going, two chords, and the melody, and that was it. Without having musical knowledge, or without having computer knowledge, you'd never be able to do it. The success of Sonic the Hedgehog's soundtrack led Sonic Team to ask Nakamura to compose the soundtrack of Sonic the Hedgehog 2. SEGA later dropped Masato Nakamura for Sonic the Hedgehog 3 due to financial disagreements, and hired a selection of other composers to make the music. For Sonic the Hedgehog CD and most of the other Sonic games, SEGA used composers at their music studio, Wave Master. In 2006, Dreams Come True collaborated with Senegalese-American R&B singer/rapper Akon to do a remixed version of "SWEET SWEET SWEET" and "SWEET DREAMS" (the song the Sonic 2 ending is based on in both English and Japanese) for the end theme to the Xbox 360/PlayStation 3 video game Sonic the Hedgehog. The songs were also released as a CD single in Japan. Track 9 Green Hill Zone Bizarre title, yet the whole piece is essentially green hill zone played slower and in a different style. Have a listen! Track 6 Star Light Zone You have to listen very closely to this one, sometimes people argue that it sounds nothing like the song to them, but judge for yourself. The verses rather than the chorus contain the resemblance. Track 11 Sonic 2 Ending Theme This is probably most famous reused track. "Sweet Sweet Sweet" features the same recognizable riff and melody as the Sonic 2 ending but is performed live with vocals! Variations of "Marry Me?" and "Sweet Sweet Sweet" have been released in English. "Marry Me?" was included in "Sing Or Die ~International Edition~", a direct translation of the album, while "Sweet Dreams", the English variation of "Sweet Sweet Sweet" was used as the b-side of the Dreams Come True single "Winter Song". The following games credit a "Masato Nakamura", but it is as of yet unconfirmed that it is the same Masato Nakamura of Dreams Come True. This page was last edited on 9 August 2018, at 12:54.